I'm still shocked that a regional president of one of #Italy's most reputed #wine teaching establishments (@FISARNazionale) tells his students NOT to spit. Feels utterly irresponsible. 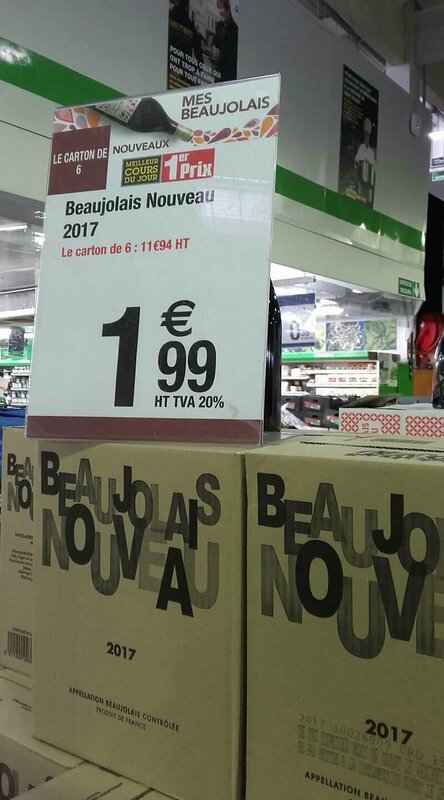 The third Thursday in November means the release of the latest Beaujolais Nouveau vintage. Another year and still the craze persists. Italians have Novello wine too… but, like with most things, the French are better organised and therefore more commercially successful. Well, commercially successful is a relative term. That supermarkets are plugging the new wine at 1,99€ a bottle devalues the work of the vineyard labourers, the winemaker and his equipment, and the price of the land and of the grapes. 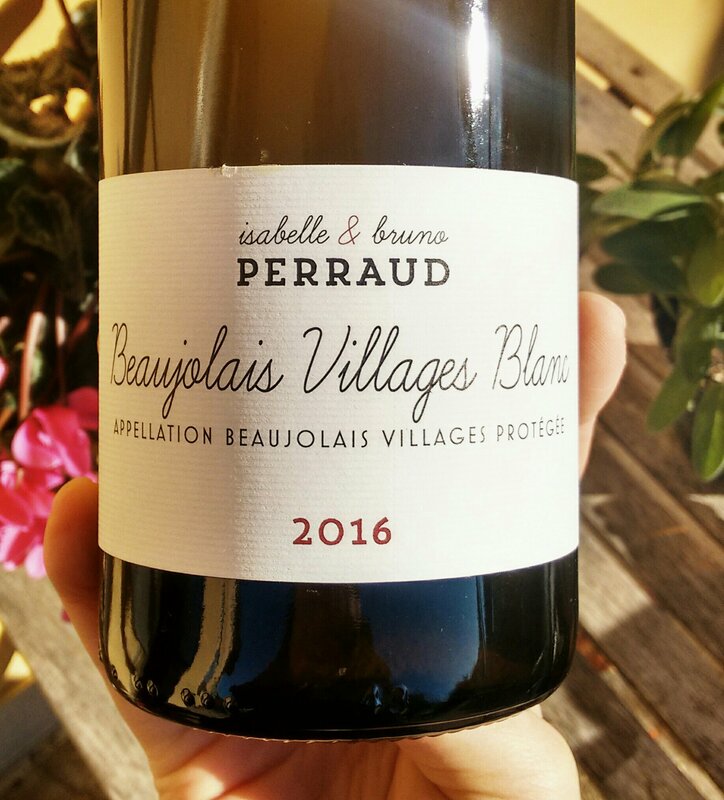 Beaujolais is hugely successful in generating interest and increasing consumption for a couple of days, yes, but in a year like 2017 with unprecedentedly low yields across the board, shouldn’t we be making consumers pay a little more? Now I know the standard of Beaujolais Nouveau has vastly increased when you think back to the banana years but most of them are not my cup of tea. The problem lies in the fact that I am not a huge fan of carbonic maceration. I know that light and fruity red wines appeal to a certain sector of the market but there’s no getting over my predeliction for wines where you taste the soil, the roots, the minerals. It’s not that Beaujolais Nouveau wines are bad, it’s just that there are better alternatives. If you don’t mind, I’ll be drinking this Beaujolais today at lunch. I had a change of scenery yesterday, spending the day in the stunning Castel Trauttmansdorff in South Tyrol, at the Naturae et Purae conference, discussing the future of natural wine and the potential place for biotechnology and genetically modified vines. It’s not the first conference of this kind that I’ve attended this year but it is the most interesting. This piece may run on a little but I do encourage you to take a couple of minutes to read it. 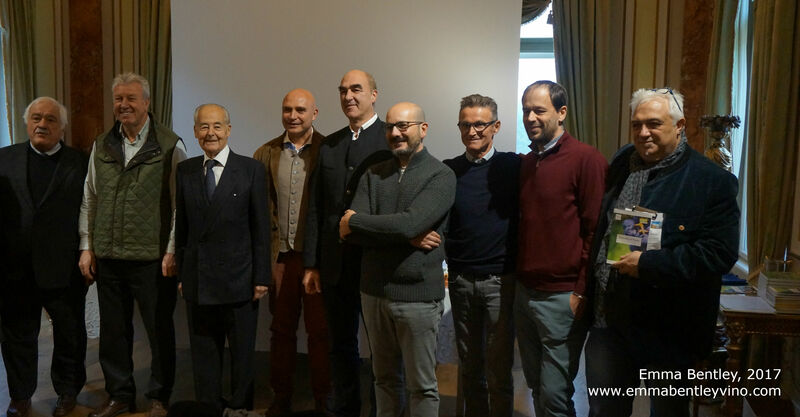 The speakers: (L-R) Attilio Scienza, Werner Morandell, Giorgio Grai, Luca D’Attoma, Helmuth Koecher, Carlo Nesler, Angiolino Maule, Hayo Loacker, Angelo Carillo. After the welcoming speeches from Angelo Carillo and then Helmuth Koecher, owner of the best eyebrows in the business and organiser of the Merano Wine Festival, we get underway! 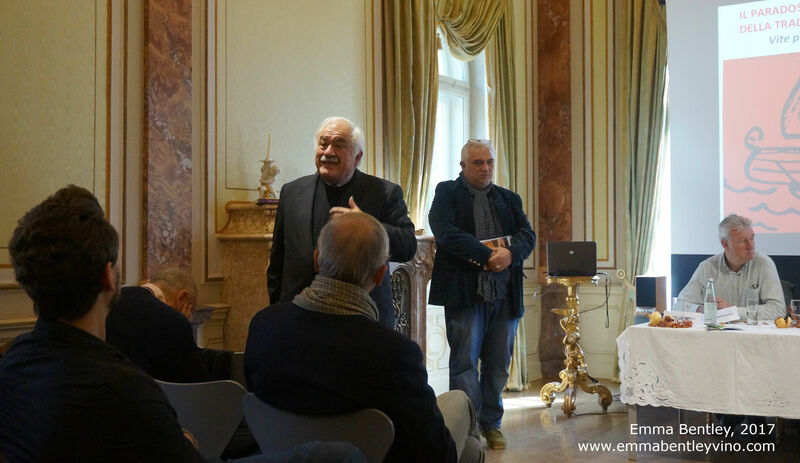 We start on a pessimistic note with a speech from Giorgio Grai, a respected oenologue now well into his 80s. He sets out the current situation of our environment: the state of our air pollution and the prevalence of fine particles, that 64% of the world’s water is polluted and we have unprecedented levels of heavy metals in our alimentary channels. “How can you have an organic vineyard situated right next to a motorway with all the exhaust fumes?” he asks. The effort needed to clean up our environment is huge. We’re not starting at 0, we’re currently at -100. Next up is Luca d’Attoma, an oenologue in his 50s, who explains his belief that “organics is a form of respect between man and his environment.” He quotes some statistics about the rise of organic agriculture in Italy: an increase of 24% between 2015-2016 of certified organic vineyards and a 51% increase in the mass retail sector between 2015-16 in sales of organic produce. 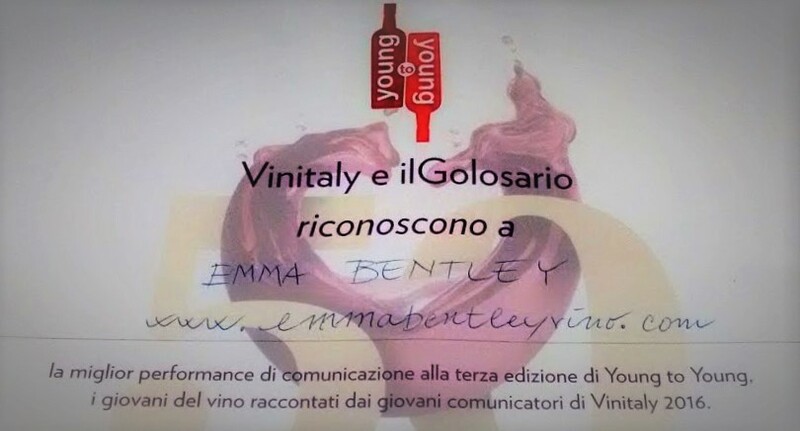 Unlike Giorgio before him, he beliefs that organic and biodynamic wines are “more original, authentic and therefore richer” than wines made from conventionally farmed grapes. That said, he acknowledges that the restrictions on organic vinification are too light. For example, 150mg/l of SO2 is allowed in conventional red wines and 100mg/l for organic red wines. He highlights problems with the controllers who certify if a farmer or winemaker is working to organic principles. There are too few controls and far too much disparity in the quality of these controls between the north and south of Italy. Following is Hayo Loacker. The Loacker family own three wineries but the flagship is the Tenuta Schwarhof in Alto Adige. They were the pioneers in the area for organic then biodynamic agriculture (starting in 1978) and in the 90s and 00s the inspiration for many other local wineries (e.g. Lageder) to convert. What is interesting is that despite their homeopathic approach to viticulture, they have planted hybrid grape varieties as well as the traditional and autochthonous varieties; essentially incorporating modernity with the past teachings of Steiner. 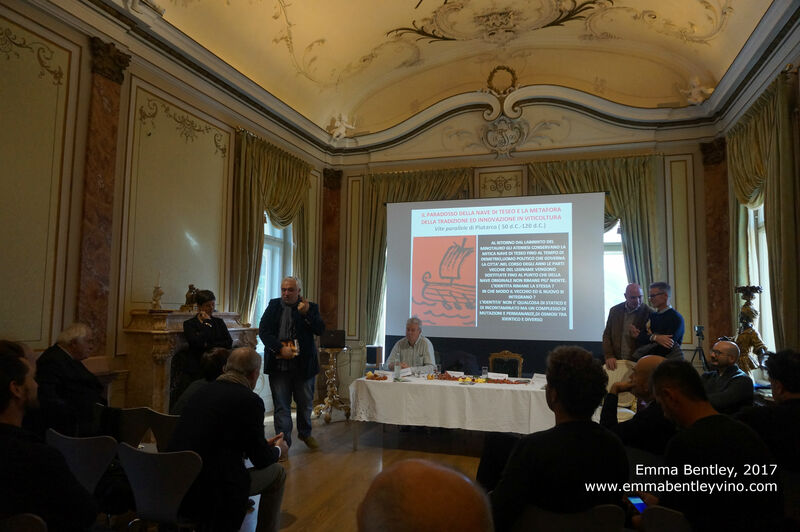 Angiolino puts forward a little-known nutritional argument for natural wines quoting a study by Dr Laura Di Renzo (Univ. of Tor Vergata) in which it was found that conventional wines only had negative side effects on the human body (pesticides, alcohol, sulfites.) Organic wine had some anti-oxidants which compensated the alcohol but was pretty nutritional-neutral. Unfiltered, low-sulphur natural wine, however, had so many positive benefits that it far outweighed the alcohol on balance. Responding to Luca D’Attoma’s comment, Angiolino tells the room how VinNatur’s own members have told the controllers how to conduct the tests and what to look for. Next up is Werner Morandell from the organic Lieselehof Winery. 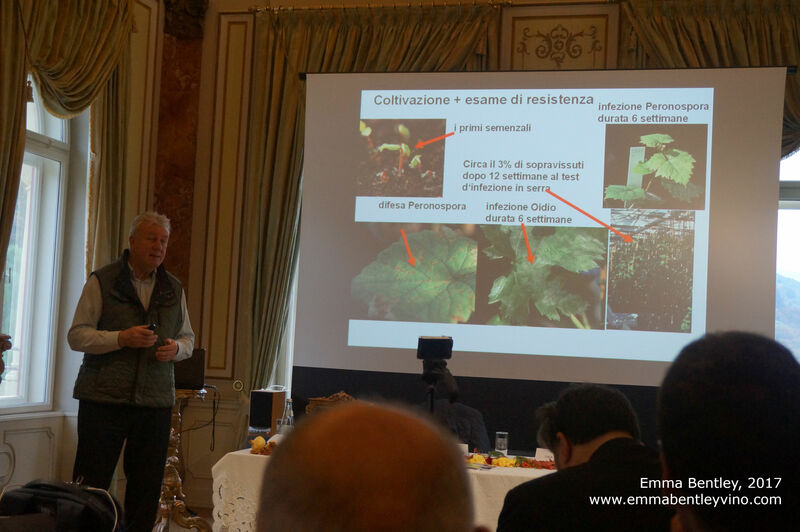 His detailed speech explains what are called PIWI grape varieties (vines with new genotypes, resulting from the crossbreeding of fungi-resistant vine varieties.) Some of the newly-created varieties quoted (Bronner, Souvignier Gris and Merlot Khorus) are resistant to powdery and downy mildew, and the cold, allowing him to plant at high altitudes and bring the plant to full maturity whilst only doing 1 treatment even in bad years. Attilio Scienza is next to take the stage. He’s an animated speaker and he comes alive during his presentation, which admittedly would have more suited to a university philosophy lecture. He puts forward the case for genetically modified foods and particularly cis-genetic vines, fortunately without going far into the scientific nitty-gritty. Knowing that there was resistance to GMO in the audience, he starts by breaking down our preconceptions. Picking up on Giorgio’s gloomy state of affairs (the first speech), it’s natural that we want to save ourselves from the end of the world, he argues rather arrogantly, and understandable that we ignorant Muggles are clinging to organics and biodynamics as the solution. Why are we against genetics? It’s just science and we shouldn’t be afraid of science. It’s progress, the future. Society is increasingly opposed to science, he continues, mentioning the increasingly common opposition to vaccines and the frequency that experts are being poopoo-ed in the media. After dipping into Greek mythology for a few choice quotes and metaphors, he gets to the point: we should accept that GM foods are already here. Strawberries, apples and tomatoes are all crossbreeds. Grains have been genetically engineered and improved. Nature does this itself, he argues, bringing up the complicated genetic lineage, with all the mutations, of the traminer variety. The moment, though, that a member of the audience asks a question – about repercussions and secondary effects – the response is that anyone who doesn’t believe in GM is ignorant and backward. Last but not least, Carlo Nesler, talking about fermentation. He’s admits being specialised in food rather than wine but his insight comes at a particularly poignant moment after Attilio Scienza. He recounts how primitive human-beings and even primates knew how to ferment food and wittingly or unwittingly, it would have been an important part of their diet. And yet, despite at least 3000 years of history, microbiotics (bifidus digestivum, kombucha and the like) have only recently been “discovered” by scientists as being essential elements for our well-being. We should always work with nature, is his conclusion, not against it. My question was the last of the day. A simple yes-no in response to: is there a place in the future of natural/organic wine for genetically modified vines? I didn’t really need to have asked the question. The most telling thing about the day’s conference was how it finished. On one side of the room is Angiolino Maule, Luca D’Attoma and Carlo Nesler, closely huddled together. In the middle, distanced from the ‘Naturalists’ but seated diplomatically in his assigned spot is Werner Morandell. Loacker has already retreated to the back of the audience, which leaves us with futurist Attilio Scienza, arms-folded, seated as far apart as possible on the other side of the room. It was startlingly obvious that we had just heard from two different worlds which seem to be mutually incompatible. That chasm was the elephant in the room. It’s time to wrap up but Angiolino has the final say: terroir. Prompted by Forbes’ piece entitled A Heavy-Handed Marriage Of White Wine And Oak Endures, I wanted to take a closer look at the use of oak in winemaking and how “oaky wines” came in and out of fashion. My main grievance with the article above and on many other occasions is how we simplify the way in which we talk about winemaking. Why is it so difficult to address the fact that it’s not just black or white; not just acidic or oaky? Spend more than a minute with any wine and you’ll realise that it falls somewhere within that spectrum and let it be said, there is a whole range of possibilities in that middle ground. A corner of the Pacina cellar, in southern Tuscany. “It’s fantastic, this Barolo, it tastes just like a Marsala,” that’s how a reputed Piedmontese oenologue remembers his grandfather describing their Sunday lunch wine. Up until World War 2, Barolo wines were commonly put in glass demijohns and left under the roof of the house for a summer to oxidise. To be fair, Barolo has become one of the most renowned and prized wines in the world whilst Marsala and sherry have been left on the shelf. 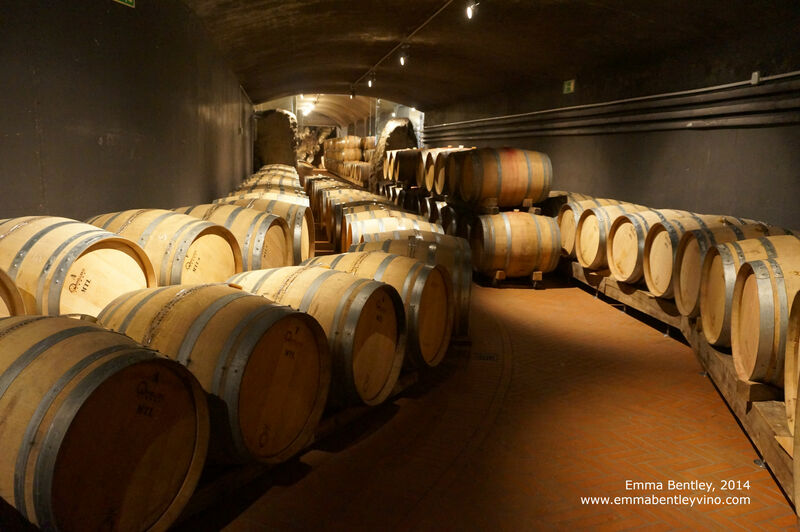 Wood definitely has its place in a wine cellar – and there’s no denying that it is here to stay – but it does seem that the trend to make wines which taste of oak has fortunately started its decline. In certain circles, it would not be an exaggeration to say that oak has become the devil and amphorae/qvevri/tinajas have been glorified. If I were President, there are many things I would do but one of the first would be to outlaw the oversimplification of things. Adults are able to process more than one piece of information. It’s not as simple as wood is wood and steel is steel. Just because the wine in front of you has been made in stainless steel tanks doesn’t mean you will be drinking lemon juice. 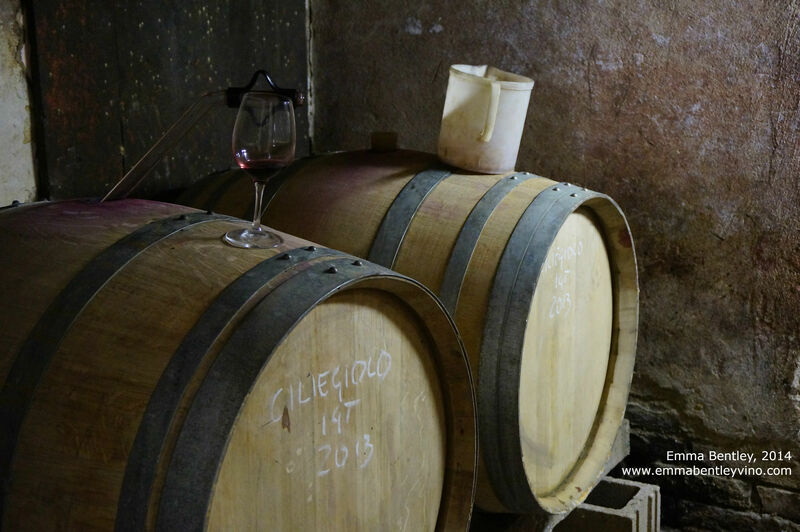 Leave the wine on the fine lees, do a little batonnage, let the malolactic fermentation occur… and you’ll end up with a wine which is neither oaky or (overly) acidic. That’s just one example. There are so many other variables in a winemaker’s armoury. The vessel is just one aspect. And hey, why does it just have to be about wood, steel or cement? There are other possibilities too. Don’t we realise that wine can also be made in carbon fibre? It’s cheap, easy to clean, and many winemakers when they’re starting off have one or two. Large glass demijohns too. They may not be elegant nor overly sophisticated but they do give you a neutral alternative for ageing wines when you’re working with small quantities. The barrel room at Isole e Olena, in Chianti Classico. Our capacity in the English language to express the size of the barrel is severely limited. We’re forced to borrow from the French and that often comes across as snooty and pretentious. The reason barrel size matters is because the amount of oakiness is largely dependant on two factors: how new the wood is (because when fresh, it will impart a stronger flavour) and the amount of wine in contact with the wood. Therefore a new, small barrel will transfer a lot of its character to the wine. The flip side of this is that, if the wine was aged large, old oak barrels chances are it won’t taste of vanilla and buttered toast etc. A good winemaker can use wooden barrels without you necessarily being able to detect it in the glass. Look out for the word foudre in French, or botte grande in Italian. Bonus points if the word “old” is used as a qualifying adjective. Finally, I opened a bottle of Freisa yesterday. It’s a little-known Italian red grape variety hailing from Piedmont, that I very much enjoy. It tends to make simple, not too tannic, wines, which are wonderful at lunch time. Let’s call it Italy’s equivalent to a Brouilly or Fleurie. In this case, I’m not familiar with the producer but the label says that this is bottle number 1507 of 2600. My optimism in this case turns out to have been horribly misplaced. The problem is that Freisa simply does not lend itself to a vinification in dominant wooden barrels. This particular wine tastes horribly astringent – much like how I imagine it to be were I to chew on a stick. This level of tannin is, in my opinion, a defect just as serious as brettanomyces. The wine is undrinkable.